You may wish to see an introductory page with a map of the walls first. Heraclius had to sustain the siege of the Avars in 626 and Leo III that of the Arabs in 718. Based on the experiences they made during these sieges, they modified the initial stretch of the walls (from the Golden Horn), which therefore does not follow the general pattern. This section was very important because it protected the Palace of Blachernae where the Byzantine emperors often stayed before the Xth century and which afterwards became their principal residence. 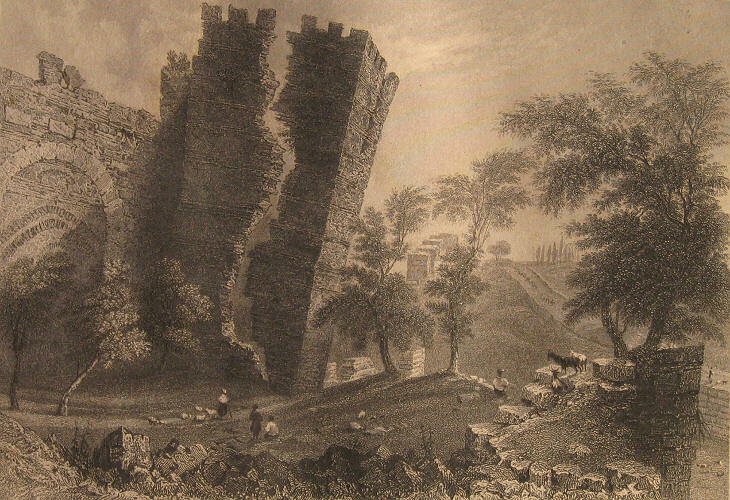 Two large adjoining square towers were built in the XIIth century to strengthen the defence of the imperial palace. 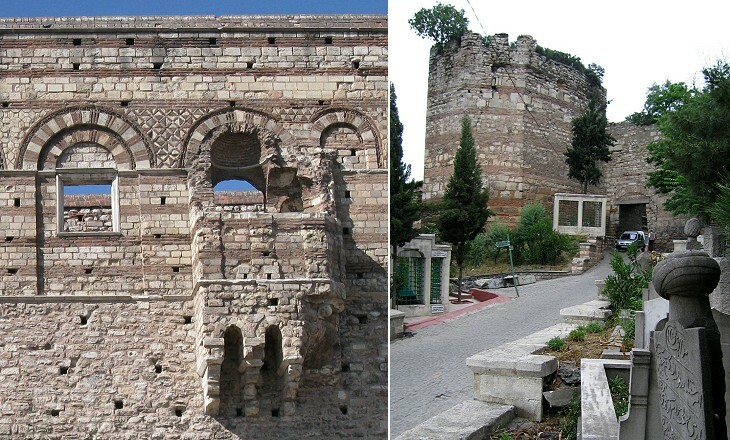 That to the left is known as the tower where Anemas, a Byzantine commander charged with plotting against Emperor Alexios I Komnenos was imprisoned in 1107. The other one was built by Isaac II Angelos (emperor from 1185 to 1195, and again from 1203 to 1204). Ancient columns were utilized for the construction of its upper storey. As a matter of fact the towers were useless because in 1204 the Crusaders of the Fourth Crusade entered the palace from the city side, after having seized some towers of the maritime walls and opened three gates to let their comrades in. 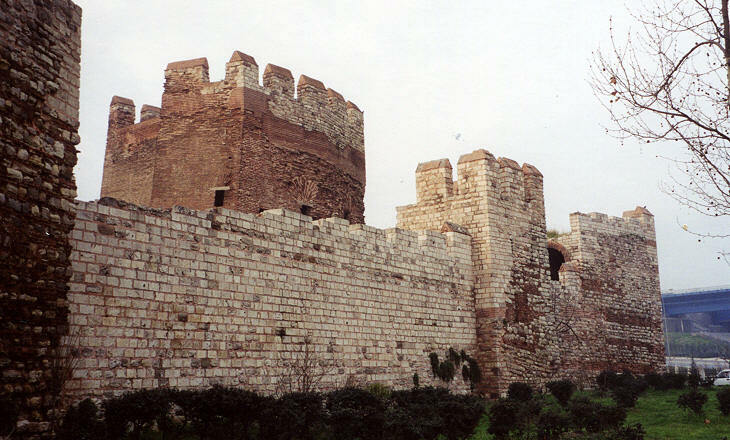 In 1261 Michael VIII Palaiologos restored a Byzantine dynasty on the throne of Constantinople. 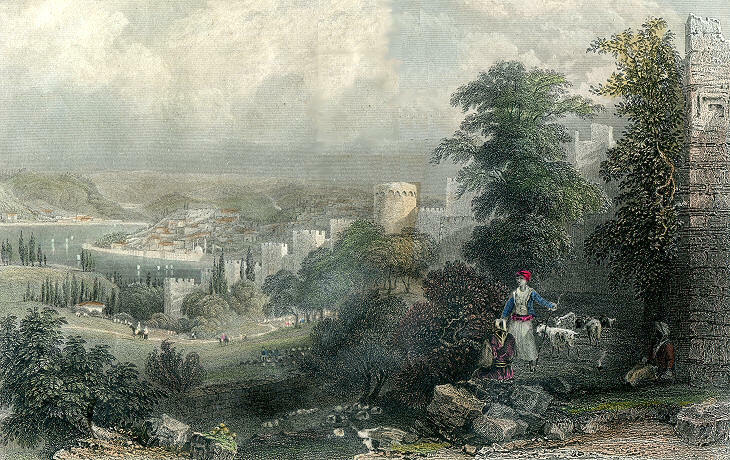 Constantine, one of his sons, built a new, small palace near that of Blachernae which had been too badly damaged in 1204. Because Constantine was born in the city he was called porphyrogenitus (purple-born, a title given to emperors who were born in a porphyry-decorated room in the imperial palace) and the building was known as the Palace of the Porphyrogenitus. Turkish Tekfur means sovereign. 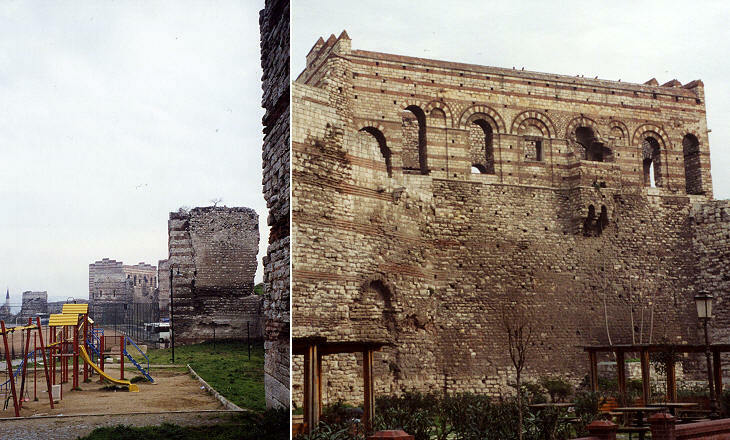 The walls of Tekfur Sarayi are the main remaining example of a Byzantine palace in Constantinople, the imperial palaces of Blachernae and of the Hippodrome being buried under the houses of a heavily populated neighbourhood (the former) or under Sultan Ahmet Kulliyesi (the latter). A small gate near Tekfur Sarayi was called Kaligaria by the Byzantines because it was situated near the workshops of boot-makers (kaliga). It is now known as Egri Kapi (Crooked Gate), because of a bend in the street leading to it. According to some Turkish historians it is the gate which in 1453 was left inadvertently open. 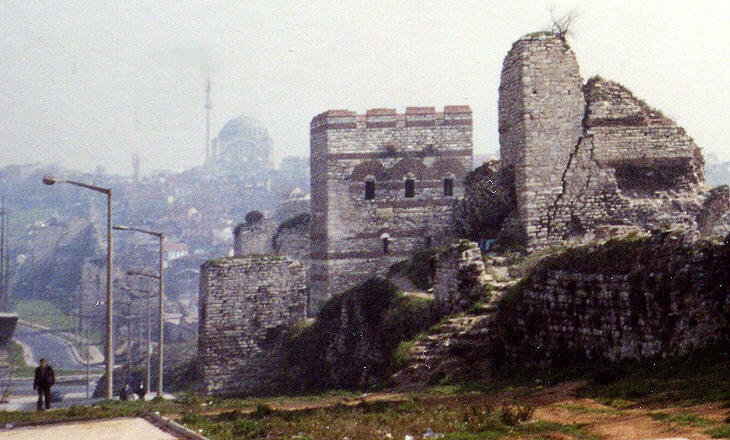 Some Ottoman soldiers reached the top of the nearby tower and first flew their red flag on the walls. 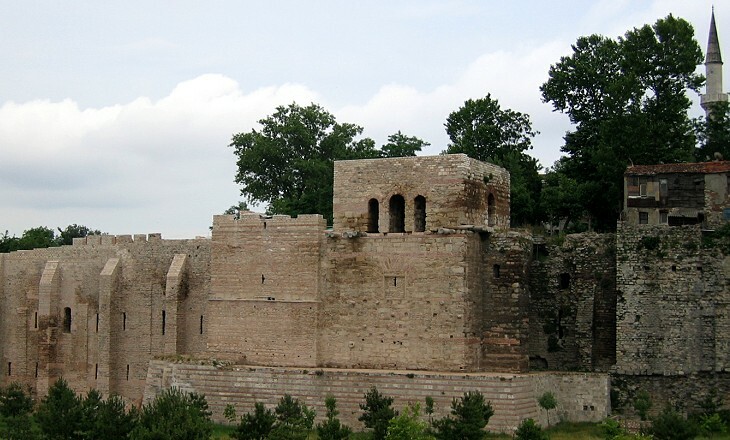 This gate is situated at the highest point of the walls on the road leading to Adrianople (Edirne) which in 1363 became the capital of the Ottoman Empire. On May 29, 1453 Sultan Mehmet II made his triumphal entrance into the city through this gate. In 1453 the fiercest fights between the attackers and the defenders occurred in this section of the walls. Notwithstanding his appeals for help to European nations Emperor Constantine XI could rely only on his small army of 5,000 and on 2,000 Venetians and Genoese who volunteered to fight by his side. 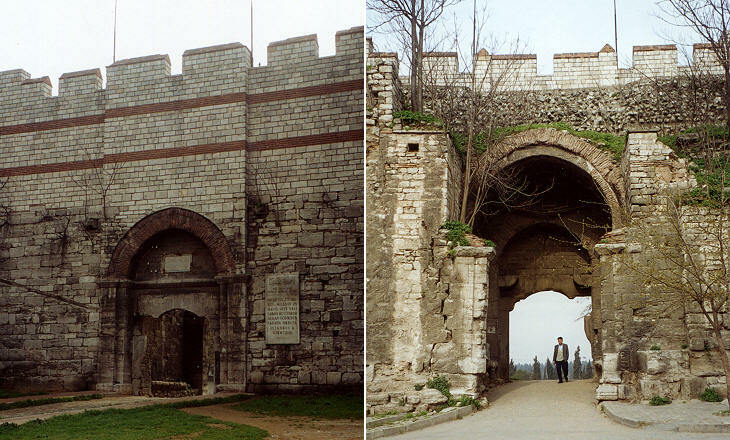 This small gate was renamed Hucum Kapisi (Gate of the Assault) by the Ottomans because according to some accounts their first troops entered the city through it. 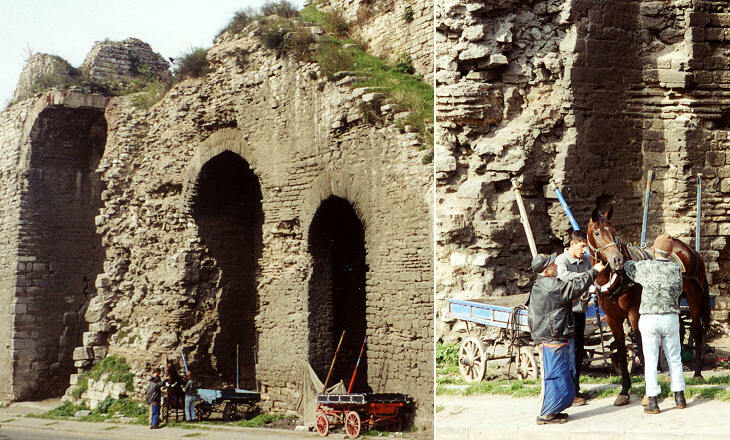 Byzantine chronicles say that Emperor Constantine XI made a last attempt to halt their advance at this gate. He had repeatedly refused to save his life by repairing to Mistras in Greece, his last possession outside Constantinople. The death of Emperor Constantine XI is reported in many chronicles, but they do not agree on many details about how it occurred. According to a legend which was very popular during the Greek War of Independence (1821-832) and until the 1920s he was saved by an angel in order to lead in the future the liberation of Constantinople from the Ottomans. how sadly those around him talk. "I would rather die than live." From "Theophilos Palaiologos" by Constantine Cavafy - Collected Poems - Translation by Edmund Keeley. Kyr (Sire) Theophilos Palaiologos was a kinsman of the emperor and was killed fighting at his side. His words are usually reported as having been said by the emperor himself. The image used as background for this page shows a detail of Tekfur Sarayi.